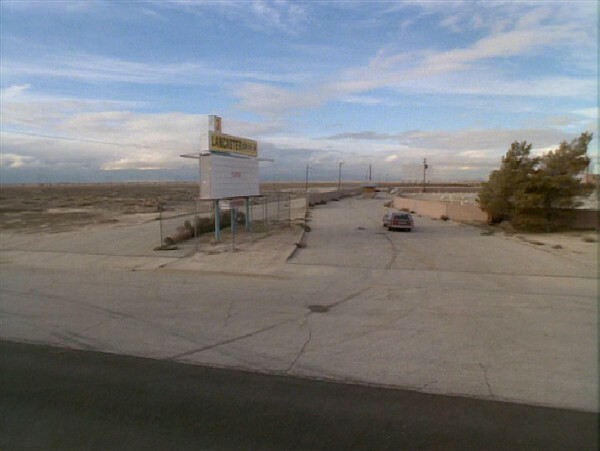 Despite some very subtle clues we provided on our Monday post and on the Beyond the Marquee Facebook page, we’re betting that no one out there was able to guess the 16th LOCATION, LOCATION, Location? entry…and that’s probably just how the DIA (Defense Intelligence Agency) would like to keep it! Admittedly, this 16th LOCATION, LOCATION, Location? 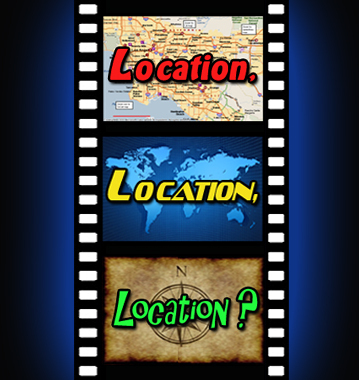 entry was very difficult to guess considering that the majority of what was seen in the NOW picture didn’t exist during the filming of this article’s featured movie. It also didn’t help that we blurred out a couple of identifying details as well. The site in question for this LLL is the desert location of WAMP–a secret underground military weapons bunker headed by the Defense Intelligence Agency as seen in the 1985 John Landis comedy, Spies Like Us. The Lancaster Drive-In as seen in ‘Spies Like Us’. 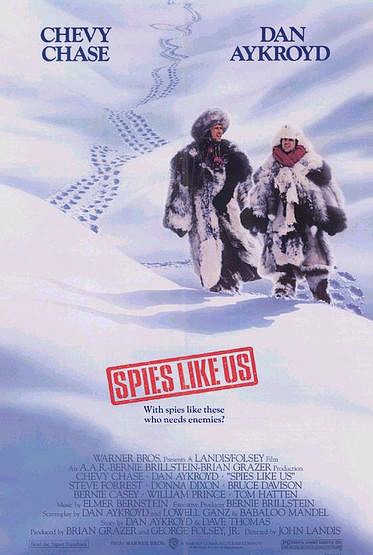 Starring Dan Aykroyd and Chevy Chase, Spies Like Us was released during the holiday season of 1985 and went on to become a box office hit. Critics held an unfavorable view, but audiences loved it and subsequent VHS rentals placed it firmly on the 80’s pop-culture map. Without a doubt, the film is definitely a product of the 80’s since its plot is based around the Cold War with the Soviet Union, nuclear arsenals, and the Strategic Defense Initiative–the ‘Star Wars’ defense plan spearheaded by President Ronald Reagan (who happens to make several cameos in the film). 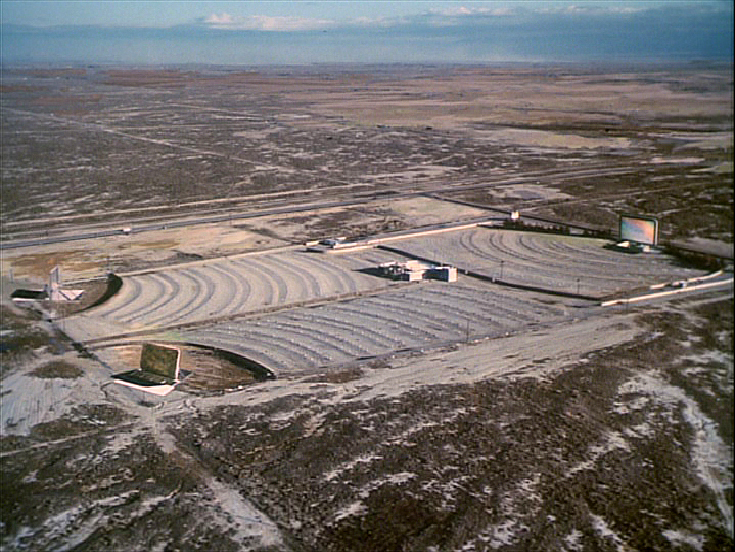 An aerial overview as seen from ‘Spies Like Us’. Spies Like Us came from the mind of Dan Aykroyd who admittedly had and still does have an innate interest in government conspiracies and cover-ups. Written by both Aykroyd and SCTV’s Dave Thomas, the script’s origin can be placed back as early as 1981 in which the film was intended as a buddy comedy to star Aykroyd and his fellow SNL partner, John Belushi. In a 1981 “Today Show” interview with Gene Shalit, Belushi and Aykroyd discuss a planned ‘spy movie’ featuring both of them. 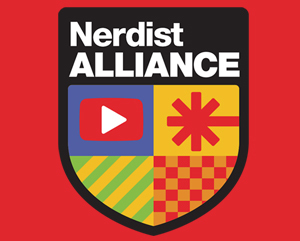 That interview can be viewed near the end of this article. The armed entrance to the dilapidated Lancaster 3. 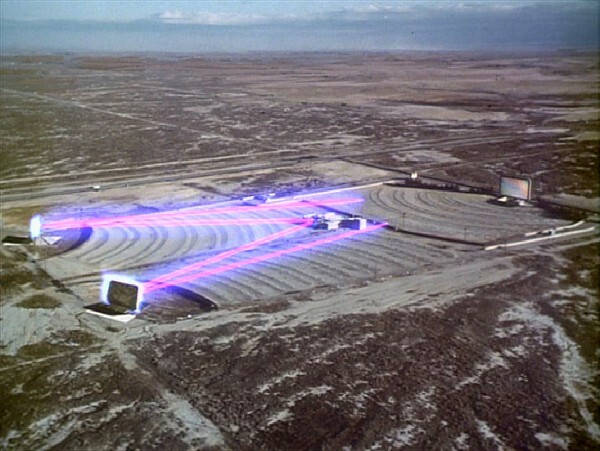 “A weapon unused is a useless weapon” and it’s for this reason that Sline intends to send up an enemy missile to test the US government’s 60 Billion Dollar anti-ballistic missile system (a large pulse-emitting laser located out in the desert under an abandoned drive-in theater). Screen 1 – looking toward the main entrance road. 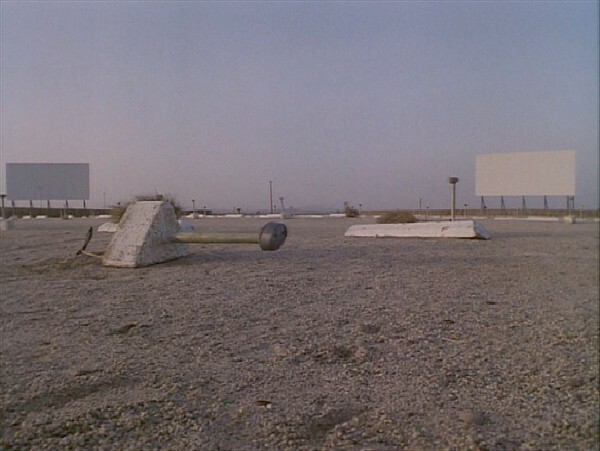 The filmmakers didn’t have to go too far in Southern California to find a location that worked as an abandoned drive-in theater. 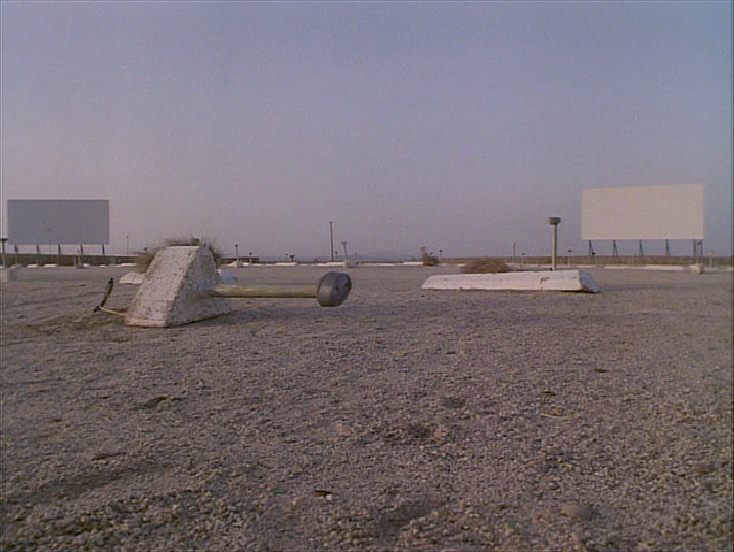 About a 1 hour drive north of Los Angeles in the desert locale of Lancaster, California, stood the remains of the recently closed Lancaster Drive-In. It was ideally set north of the town in an unpopulated area and coincidentally enough, just southwest of Edwards Air Force base. 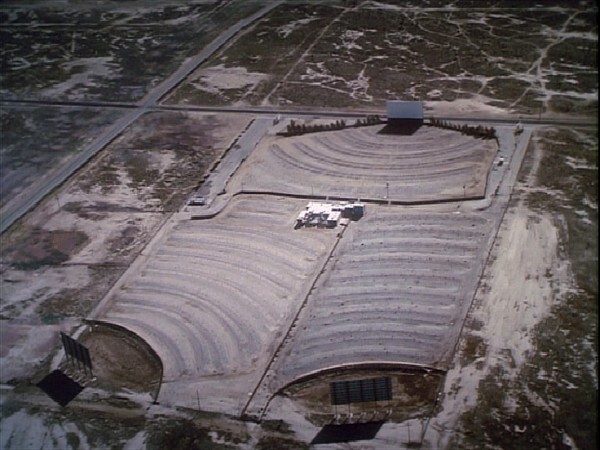 In 1984-85 when Landis and Co. filmed there, it was the perfect spot for a secret hidden weapons bunker – albeit boosted with some help from clever miniatures, matte paintings and special effects. An aerial view of the Lancaster Drive-In circa 1974. It didn’t look much different than this when it was first built in the 50’s. 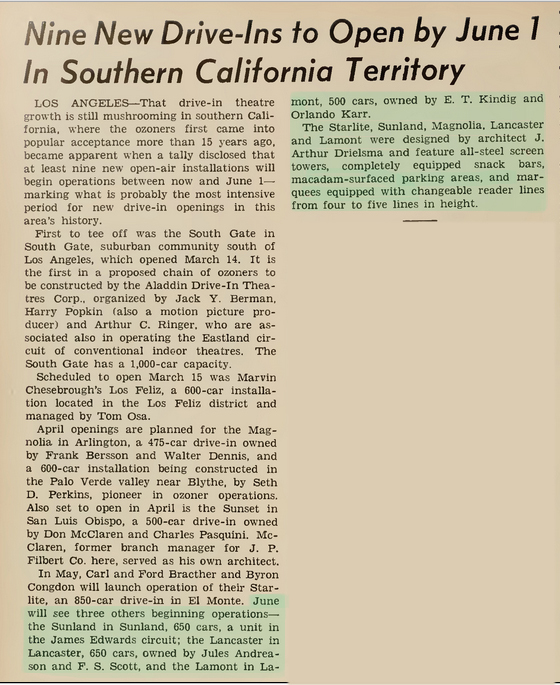 March, 1950 Boxoffice Magazine article about the Lancaster being built. 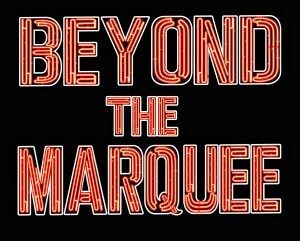 Beyond the Marquee has had a knack for finding location exclusives before and this location certainly revealed some secrets that would make Austin Millbarge (Aykroyd’s character) and the Defense Intelligence Agency proud. While scouting the location in person, finding any trace of identifiers from 1985 and what’s seen in Spies Like Us seemed like a lost cause. 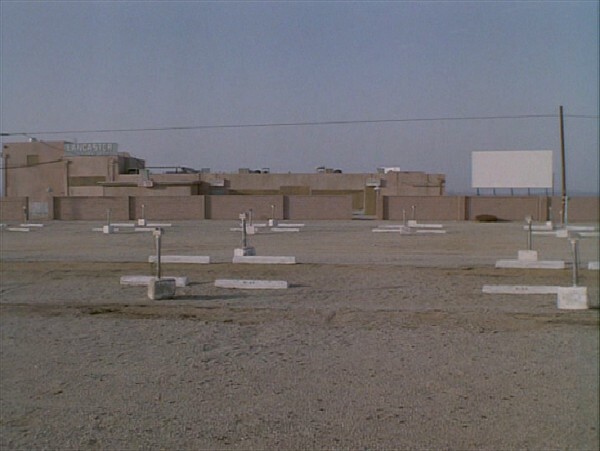 The entire drive-in is now built over by the City of Lancaster Maintenance Yard and other than bordering highways and a service road, not much could be seen that seemed original to 1985. 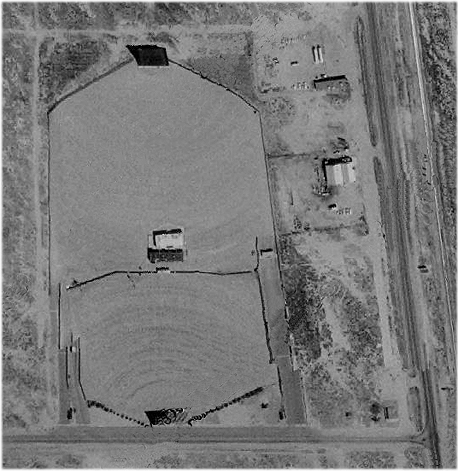 While compiling photographs taken at the site and doing research for this location entry, a simple Photoshop overlay of a 1974 satellite image of the drive-in mated to a current image of the Lancaster Maintenance Yard revealed that a key piece of the Lancaster Drive-In does, indeed, still exist! 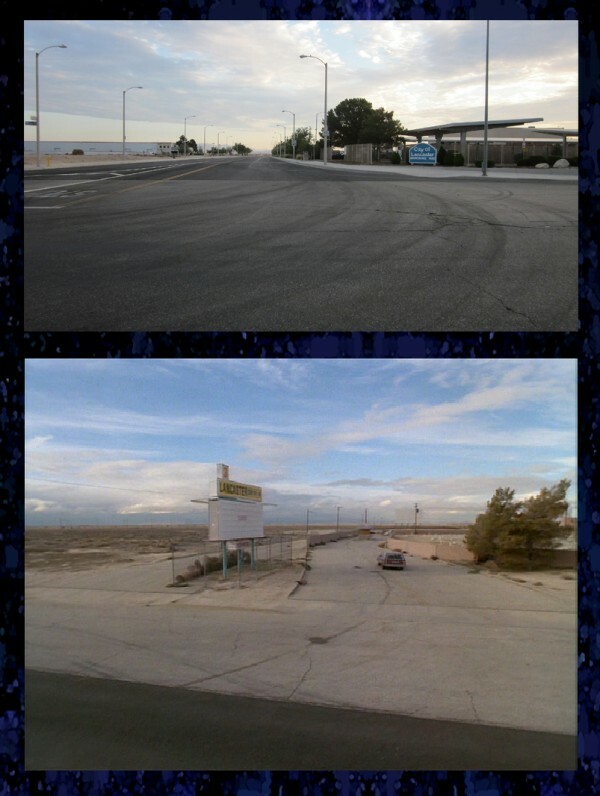 Side-by-side and combined maps reveal the Drive-In concession stand still exists. The key to lining up the two images came down to two propane tanks and a building located in the upper-right corner of the property. The tanks existed in the 1974 satellite image and are still there to this day in the exact same spot. They currently belong to the Suburban Propane Company, a multi-million dollar corporation that bought out California’s Vangas, Inc. in the early 70’s – most likely the original owners of the tanks as far back as the 1960’s at that location. The business office still stands today just a short walk away from the tanks. The Lancaster concessions building in 1985. Looking at the matched images, something else became amazing clear. 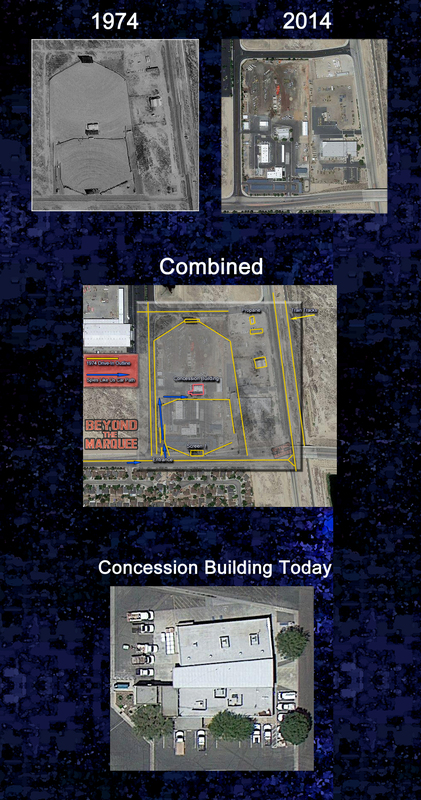 In the center of the map, one of the current day maintenance yard buildings exhibited the same footprint as the concession/projection building from the old drive-in. Sure enough, the current day building is nothing more than the concessions building heavily remodeled for use at the Lancaster Maintenance Yard. One side of the building was converted to what appear to be garages while the ‘front’ side seems to hold offices. It’s that front side you see prominently in Spies Like Us when Ruby and Keyes show up in their car. Michael Apted, B.B. 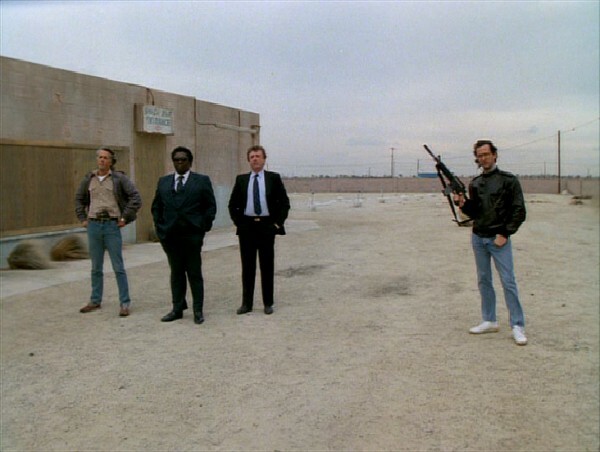 King, Larry Cohen and Martin Brest stand guard at WAMP. 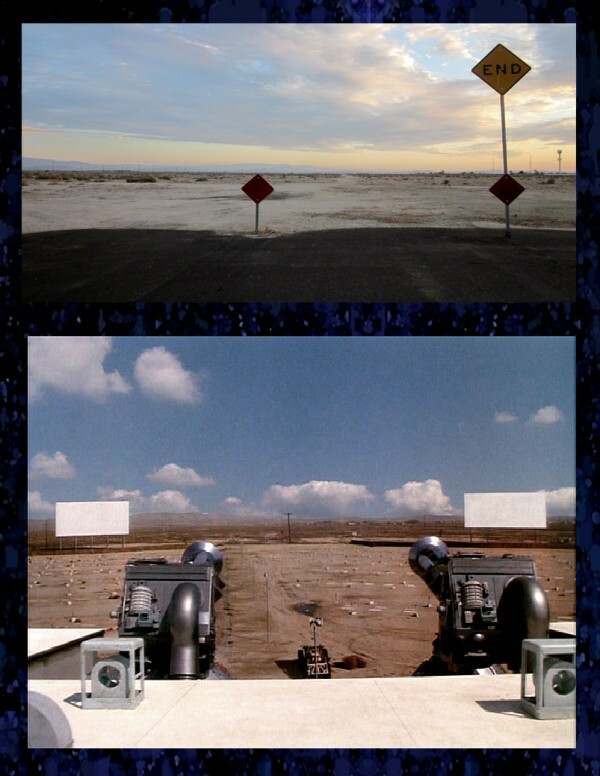 Looking at the matte aerial effect shots from the movie reveals that the filmmakers did do a little bit of airbrushing to the property as well. 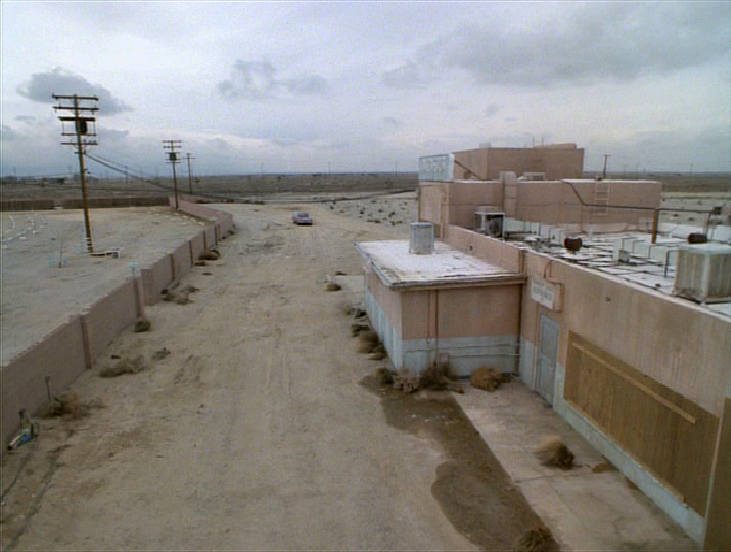 To the right of the drive-in property line and between the highway sits a building that doesn’t show up on the aerial views in the film. 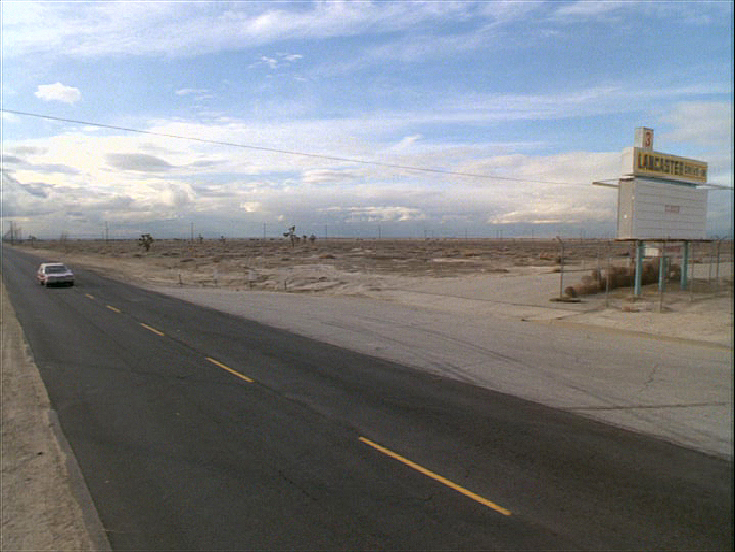 However, a sharp eye will catch the slope of the roof from that missing building located just behind and to the left of writer and director Larry Cohen during his cameo. He’s the one who greets ‘Mr. Keyes’ during one of many cameo-grabbing scenes spread throughout the film. It’s B.B. King’s invitation to ‘have a Pepsi’ that leads Ruby and Keyes to the secret elevator hidden below the snack bar. 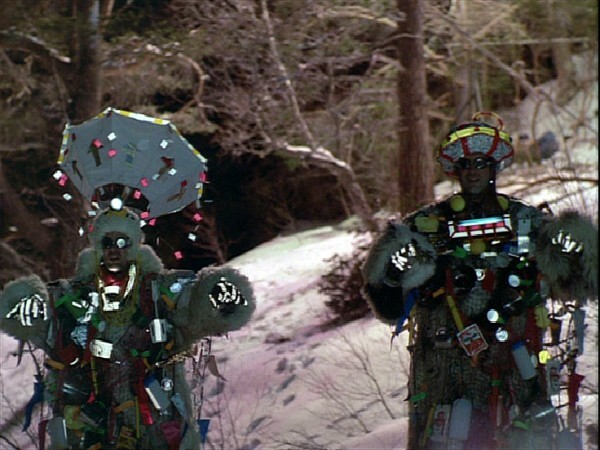 For what is now considered a somewhat forgotten hit, Spies Like Us actually holds up pretty well among the other Landis-Aykroyd comedies from the 1980’s. 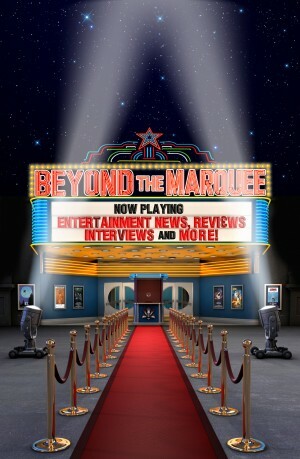 It features some memorable and hilarious one-liners, multiple cameos from people in the entertainment business, a rousing score by Elmer Bernstein and miniature special effects by Derek Meddings (who also has a cameo) that still manage to outshine anything a computer effects artist can do today with a mouse and keyboard. A side aerial view of the Lancaster as seen in ‘Spies Like Us’. It’s a shame that Warner Bros. Home Video doesn’t think very much about this film. To date, they have only released inferior copies of Spies Like Us on DVD and Blu-Ray. The DVD features a cropped Standard 4:3 transfer that can only be described as muddy-at-best (a look at the screengrabs here can testify to that). And don’t be fooled by the Blu-Ray version that is paired with the Chevy Chase comedy, Funny Farm. The Blu-Ray transfer is nothing more than the 4:3 version expanded and cropped on the top and bottom to simulate the original widescreen ratio. 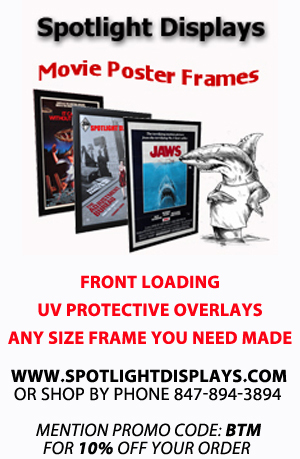 If you must have the film, getting the cheap DVD version is currently your best bet. Hopefully, someday Warner Home Video will wake up and do a nice hi-def Blu-Ray treatment of the film with some bonus features thrown in for good measure. 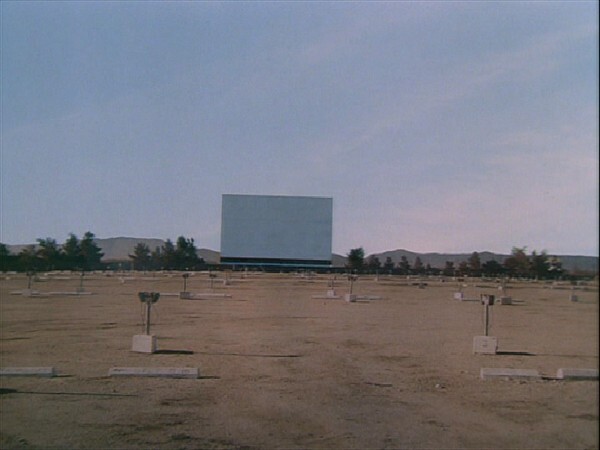 If blurry definition doesn’t cut it for you and you want to see what’s left of the Lancaster Drive-In in person, head on out to the desert and check it out for yourself. Just don’t plan on catching any double-features while you’re there. Dan Aykroyd and John Belushi on the Today Show. Spies Like Us mentioned at 3:44. The WAMP anti-ballistic missile pulse laser fires up. A look west down the road from the Lancaster 3. Clever miniatures combined with real-world locations. A look at the front side of the concession building in 1985. 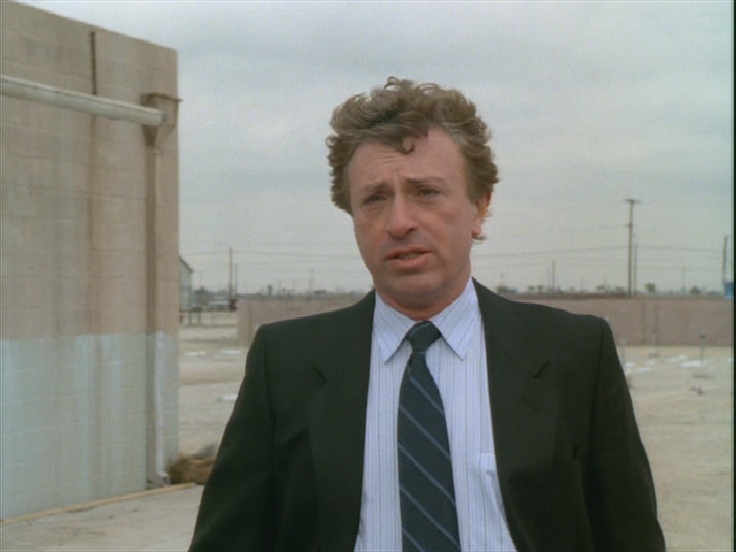 The sloped roof of the building that was airbrushed out in the aerial shots can be seen just behind and to the left of Larry Cohen in this screen grab. The view looking out to the desert from the concession stand hasn’t changed much since 1985. « Check Out Angelina Jolie as MALEFICENT on the cover of the New Entertainment Weekly Magazine! 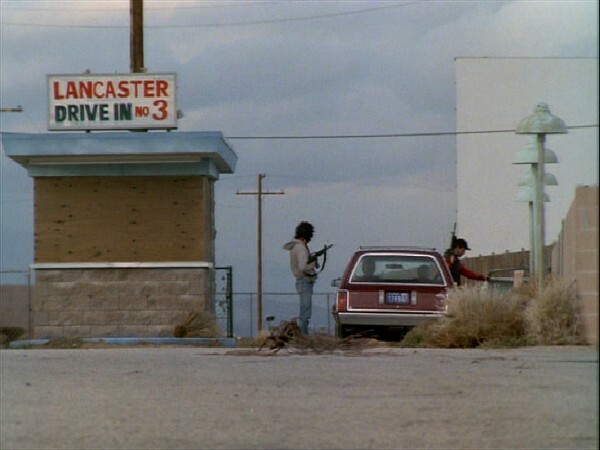 I grew up in Lancaster and resided less than a mile away from the drive in,and still do to this day – It’s nearly impossible to find any behind the scenes info on the great Spies Like Us film shoot that came to town in the winter of 1984-85. I was 7 years old at the time and our house was located in a neighborhood just west of the Drive In – The production team actually came in and placed fake greenery/foliage over the end of our street as well as a modular trailer/office for a housing developer that would go onto to build a 200+ housing tract starting in the summer of ’85. HBO showings of Spies Like Us created a massive interest in the drive in as all of the clueless youngsters and teens actually thought that the screens were capable of folding down into the desert – This created a headache for the owners who then had to deal with constant trespassers, vandalism as the theater became a hang out spot and place to party – By early 1987 the place had been so badly vandalized that the owners gave up and sold the property to the city of Lancaster.